Looking to host a birthday party in MN? Everyone has a birthday once a year and most people enjoy celebrating with a party. The age-old question is how and where to celebrate your birthday. Action Packed Paintball Games has developed a great idea for a birthday party, bring your party to their paintball park and let the extreme fun begin. We are Minnesota’ paintball party headquarters. 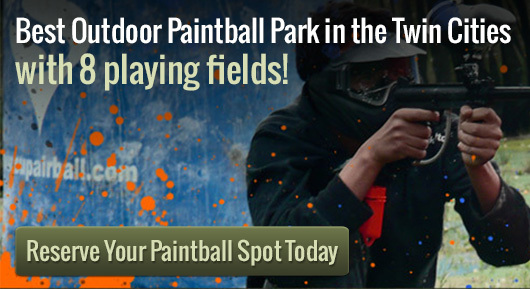 Action Packed Paintball Games is the Twin Cities’ premiere paint ball facility with eight completely different fields and several facilities. Whether you are a beginner or an experienced pro you will be able to enjoy the experience. There is paintball equipment, guns, and protective gear for rental. Naturally, there is CO2 and paintball ammo available along with a friendly staff to assist and answer any questions. The next time you need a suggestion for an activity based birthday party in MN look to Action Packed Paintball Games. There is a minimum age for participants and a trained paintball referee supervises all groups. No experience is required, as teams will quickly develop their own strategy and skill while at the same time having a blast. Remember to call us at 952-492-6776 in case you have any questions or if you would like to book a time.